Samford University business professor Cynthia Frownfelter-Lohrke is no stranger to the flipped classroom learning concept. She has used it on some level for more than a decade to help students be more active, engaged learners. Her interest began when she realized members of an undergraduate management information systems class needed more hands-on help with certain assignments. “It was difficult for them to complete projects, and often they wouldn’t ask me for help,” recalls Frownfelter-Lohrke, who knew the students could learn the textbook material outside of class, but needed her extra attention with projects in class. It was a perfect scenario for implementing flipped learning, a pedagogical model in which the typical lecture and homework elements of a course are reversed. Often, video lectures are viewed by students at home before the class session, while in-class time is devoted to exercises, projects or discussions. Over time, as she saw better learning and grasping of ideas by her students, Frownfelter-Lohrke incorporated more flipped learning concepts in her teaching. One recent semester, her information systems students participated in an on-line simulation offered by Harvard Business Publishing, which freed class time for valuable hands-on learning, such as when they “broke apart a computer,” Frownfelter-Lohrke said. Because of the positive outcomes she has seen in her classrooms, Frownfelter-Lohrke is especially appreciative of a new campus-wide attention to flipped learning. Last spring, Samford’s Center for Teaching, Learning and Scholarship director Eric Fournier launched a Flipped Classroom Faculty Learning Community to help faculty members incorporate the concept in their teaching. During the summer, four classroom spaces in Brooks Hall were renovated to accommodate active learning, including flipped classes. The value of a flipped class, according to some experts, is the repurposing of class time into a workshop where students can inquire about lecture content, test their knowledge skills and interact in hands-on activities. The instructors function as coaches or advisors, encouraging students in individual inquiry and collaborative effort. 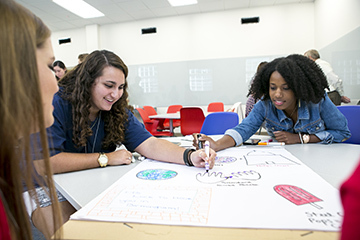 “The flipped classroom concept has been gaining traction nationally for several years,” said Fournier, who knew that some Samford educators, such as Lohrke, were already implementing it independently. “I realized there was a lot we could learn from each other, so the learning community was set up as a way for Samford faculty to investigate the issue together,” said Fournier, a Samford geography department faculty member since 1997. The 25-member group includes faculty members from disciplines across campus. Helpful sessions and resources include online seminars on topics such as best practices, reading materials, discussions with other group members and consultations with CTLS staff. The key idea for the renovated spaces in Brooks Hall is flexibility, Fournier said. “The rooms are intended broadly for active learning with flipped just one of many possible uses,” he said. The rooms have moveable furniture designed for multiple configurations and walls covered in glass boards for student brainstorming activities. Interactive, high-definition monitors allow students to connect their electronic devices and collaborate in the classroom spaces. The spaces also received new carpeting, lighting, paint and other upgrades. For Frownfelter-Lohrke, using flipped learning in her classes represents a far cry from her first college teaching experience 23 years ago. Haley Shaw, a senior accounting major and one of Frownfelter-Lohrke’s recent students, applauds the flipped classroom learning approach. “I’ve already used many things that I learned, both from what she taught and from the hands-on experience,” said Shaw, who was in Frownfelter-Lohrke’s class that tore apart computers last spring to see how they worked. “It was really practical to be able to work individually and with a team to do projects and see how what we’re learning in class applies in real life,” Shaw said. After graduation, Shaw, who is from Columbia, Tennessee, plans to pursue a Master of Accountancy degree at Samford and work as a public accountant.